In an effort to get back into the NFL, free agent running back Fred Jackson will participate in a Spring League showcase game next month. Unsurprisingly, then, the 36-year-old believes he’s still capable of contributing, telling SiriusXM NFL Radio: “All I need is an opportunity. I have no doubt if I got into a training camp I would prove I can still help a team win.” Jackson also acknowledged that general managers “get scared away” by his age, but he noted that he’s in “great shape” (Twitter links). A prominent part of Buffalo’s offense from 2007-14, Jackson played sparingly with Seattle in 2015 and was unable to find a job last season. Quarterback Colin Kaepernick has hurt his cause by staying silent throughout the free agency process, opines Mike Florio of Pro Football Talk. The polarizing 29-year-old hasn’t publicly revealed his financial demands, whether he’d jump at any NFL offer or whether he’d continue his career in Canada if necessary, which Florio regards as a mistake. Florio also criticizes Kaepernick’s agent for not calling all 32 NFL teams earlier this offseason in an attempt to drum up interest in his client. 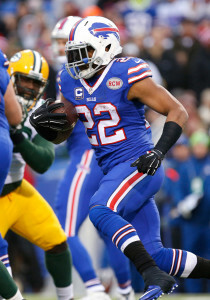 Even at the age of 36, Fred Jackson is not ready to walk away from football. The former Bills running back says that he has yet to ink his retirement paperwork and still feels that he can contribute to an NFL team. Jackson spent eight years with the Bills uniform, rushing for 5,746 yards, placing him third on the franchise’s all-time list behind only Hall of Famers Thurman Thomas and O.J. Simpson. He also added 354 receptions for 2,897 yards, good for fifth all-time in Buffalo. The Bills cut Jackson prior to the 2015 season and he had a mostly forgettable run with the Seahawks, though he did appear in his first ever playoff game. In 2016, Jackson was out of football. For his part, Jackson says that he would love to give it another try with the Bills, though it’s not clear if they have any interest at this time. Given their issues in the backfield, could the Bills welcome Fred Jackson back to Buffalo? Starting safety Aaron Williams took to Twitter on Thursday to voice his support for such a move, as Joe Buscaglia of WKBW writes. A report in February indicated that the 35-year-old hopes to continue playing in 2016. Jackson spent the 2015 season with the Seahawks and appeared in all 16 regular season games. In total, he had 26 carries for 100 yards and 32 receptions for 257 yards and 2 touchdowns. Jackson was used sparingly in Seattle, resulting in the lowest output of his nine-year career. We haven’t heard much in the way of NFL interest for Jackson this offseason. As the Jets get ready for training camp, there are three veterans in particular who will be fighting for their spots on the 53-man roster, Dom Consentino of NJ.com writes. That list includes kicker Nick Folk, who is being pushed by rising sophomore Ross Martin after missing the second half of last season with a quad injury. Running back Zac Stacy is also fighting for a job after rushing only 31 times in eight games last year. As shown on Roster Resource, Stacy could be the odd man out with Matt Forte, Khiry Robinson, and Bilal Powell being retained. The Jets are also keeping an eye on UDFA running back Romar Morris. Patriots long snapper Joe Cardona, a Naval Academy product, was informed that his transition to the reserves is complete, meaning that he will be able to join his team at the start of training camp, according to ESPN.com’s Mike Reiss (on Twitter). On Thursday, the Pats released long snapper Christian Yount, an indication that Cardona would be available for the 2016 season. There have been multiple reports this month suggesting that the Chiefs are working on a contract extension for safety Eric Berry, making it one of their top priorities this offseason. Despite Kansas City’s obvious interest in getting something done with the All-Pro defender, no significant progress has been made at this point between the two sides, tweets Rand Getlin of the NFL Network. I identified Berry as a strong candidate to receive the franchise tag when I examined potential recipients last week, noting that the price for safeties is reasonable compared to some other positions. While that may be where this is heading, the Chiefs still have another week to try to work out something longer-term with the 27-year-old. Let’s check in on a few other free agents, or free-agents-to-be…. Appearing today on SiriusXM NFL Radio, linebacker James Laurinaitis, who was cut by the Rams on Friday, said that he’d like to join a team with a shot to win the Super Bowl. According to Laurinaitis, agent Tom Condon told him that teams have already reached out, and he should have a better idea of his options after the combine. While he admitted that he grew up as a Vikings fan, Laurinaitis maintained that he’s open to any potential suitor (all Twitter links). While one veteran Seahawks running back – Marshawn Lynch – has announced his retirement, Fred Jackson doesn’t appear ready to call it a career. According to Ian Rapoport of NFL.com (via Twitter), Jackson want to play in 2016. It’s not clear yet if Seattle will be interested in bringing back the veteran, who doesn’t have a contract for next season. A year after being traded to Detroit by the Ravens, defensive tackle Haloti Ngata is unlikely to reunite with his old team in free agency, says Jamison Hensley of ESPN.com. As Hensley writes, the Ravens simply don’t have a real need for a player like Ngata, and will likely focus on edge defenders instead. Quarterback Kirk Cousins holds all the cards in contract discussions with Washington, and the team knows it, according to Jason La Canfora of CBSSports.com. The Jets would like to re-sign running back Bilal Powell, but there were other suitors – including division rivals – lurking if New York can’t lock him up by March 9th, as Rich Cimini of ESPN.com outlines. The Renton Police Department issued a statement last night on the car accident involving Seahawks running back Fred Jackson, announcing that the collision resulted in minor property damage, but no injury to Jackson (Twitter link via Gregg Bell of the News Tribune). Renton Police confirmed that early reports of Jackson racing another team member were apparently false, suggesting that there’s “no indication” the former Bill was racing another vehicle. Curtis Crabtree of Pro Football Talk also hears from a team source that Jackson was uninjured in the accident, and that several teammates – including Richard Sherman and Marshawn Lynch – stopped to check on him before leaving the accident site. With teams around the league looking for athletic tight ends, Rams pass catcher Jared Cook has had his name come up in trade rumors early this season. Head coach Jeff Fisher has said he isn’t interested in trading Cook, but says the Rams have fielded calls about multiple players, according to Nick Wagoner of ESPN (via Twitter). Cook, who has only 15 catches in five games for the Rams, dismissed trade rumors and said he is happy with his role, according to Wagoner (via Twitter). Fisher also had to make a statement about his job status after his alma mater of USC fired their head coach, saying he wouldn’t consider leaving the Rams to coach in college, according to Jim Thomas of the St. Louis Post-Dispatch (via Twitter). Fisher cited the commitment he made to Rams owner Stan Kroenke when he took over in 2012. The Lions just put one running back on injured reserve, but could get another back in the lineup as Joique Bell is getting closer to returning, writes Dave Birkett of the Detroit Free Press. Bell had missed the last three games, and with Zach Zenner out for the season, the team only misses him more. 9:51 pm: Both Jason La Canfora of CBS Sports and Pro Football Talk contradicted the report that Jackson crashed while drag racing, as the initial TMZ report stated. La Canfora’s sources say there was no drag racing, and Jackson just lost control of his car (via Twitter). He adds that Lynch only arrived after seeing Jackson’s car on the side of the road (via Twitter). PFT also has a source that claims there was no drag racing (via Twitter). 8:00 pm: The Seahawks’ top two running backs were involved in a car accident Tuesday night, as Fred Jackson crashed his vehicle into a large planter box and then a stop sign, according to a report from TMZ. According to the report, Jackson crashed while drag racing against teammate Marshawn Lynch. The tweet from TMZ reported that Jackson was injured in the crash, but Mike Garafolo of Fox Sports 1 hears that Jackson is fine (via Twitter). Lynch is reportedly fine, and drove off on his own, while Jackson was taken back to the team facilities. The Seahawks had already been thin at running back, with both Lynch and Jackson dealing with injuries this season. It seems that not having been involved in the accident, Lynch’s injury status hasn’t been affected, but further injury to Jackson could diminish an already hampered depth chart. Additionally, if the league or team decides to take action in terms of suspension, that could also hurt the Seahawks going forward. It is unlikely that the league takes any action based on the initial reports, as they have been hesitant to suspend players before all the evidence is in–as in the cases of Aldon Smith and Sheldon Richardson–since losing in court to Tom Brady this offseason. Running back Fred Jackson was hurt when the Bills released him earlier this year and in a heartfelt piece for The Players’ Tribune, the veteran discussed the events surrounding his departure from Buffalo. Within the essay, Jackson also says that he asked GM Doug Whaley if he needed to worry about his job being in jeopardy after pulling his hamstring in training camp. Whaley, he asserts, told him not to worry about his job, but he was dropped from the roster soon after. Here’s more out of the AFC East..
James Walker of ESPN.com wonders if the Dolphins should explore their trade options between now and the deadline. He feels that wide receiver Rishard Matthews, who will be an unrestricted free agent in 2016 and looking for a nice raise, would make sense as a trade chip. Through four games (but really three games because of his quiet Week 4) this season, Matthews has posted 17 cathes, 278 yards, and three touchdowns. It’s hard to criticize Patriots running back Dion Lewis for signing a new deal when given the opportunity, Jeff Howe of The Boston Herald said on CSNNE. The Patriots signed Lewis to a contract extension through the 2017 season on Thursday. With the way Lewis is playing, that deal looks rather team-friendly at the moment. Lewis can earn up to $400K in incentives in 2016 and 2017 if he plays in 60% of the Patriots’ offensive snaps, Howe tweets. After Geno Smith suffered a broken jaw at the hand of former teammate IK Enemkpali, the Jets did not know how long their starting quarterback would be sidelined. In their efforts to address the situation, Ian Rapoport of NFL.com says the Jets called Washington to discuss the possibility of trading for Kirk Cousins (Twitter link). Now, of course, we know why Washington was unwilling to seriously entertain those communications. Washington, though, was not the only team the Jets contacted. As Rapoport adds in a separate tweet, New York did its due diligence and made plenty of phone calls around the league before ultimately settling on veteran backup Ryan Fitzpatrick to lead them at least until Smith’s return. Long before Fred Jackson signed with the Seahawks, he was supposed to be a member of the Steelers, according to Jason La Canfora of CBS Sports. After the Bills acquired LeSean McCoy in March, Buffalo GM Doug Whaley told Jackson that he would be released. Jackson had effectively worked out a deal with the Steelers and was en route to Pittsburgh when he was told by Buffalo team officials that he was too important to the Bills and the community to let go. When Jackson actually was let go a few months later, the Steelers had long since signed DeAngelo Williams to be their primary backup. That saga is what precipitated Jackson’s recent remarks that Whaley had lied to him. When Bills head coach Rex Ryan was with the Jets, he tried to acquire Tyrod Taylor, as Albert Breer of The NFL Network tweets. According to Breer, Ryan did so on the advice of some pretty respected names who were teammates and coaches of Taylor when he was in Baltimore: Ray Lewis, Ed Reed, Cam Cameron, and Jim Caldwell. When Taylor signed with the Bills this offseason, his three-year deal that will pay him just $750,000 in 2015 made it clear that he was a backup quarterback. But as Mike Florio of Pro Football Talk writes, nothing prevents Buffalo from giving Taylor a new contract at any time, and although there has been no indication that will happen, Florio believes it should. Muhammd Wilkerson‘s contract situation has garnered a great deal of media attention, but as Rich Cimini of ESPNNewYork.com writes, the Jets have two other important defensive starters who are in the final years of their respective contracts: Demario Davis and Damon Harrison. As Cimini writes, the Jets have made no push to sign either before the start of the season, as they want to see how the players fit in the team’s new defensive scheme before making a long-term commitment. Matt Cassel‘s base salary on his new deal with the Bills is down to $2MM from the $4.15MM he was set to earn on his previous pact, tweets Field Yates of ESPN.com. However, according to Yates, the veteran quarterback can earn up to $4.15MM via incentives on the new contract. Presumably, Cassel would have to reclaim the starting job to achieve any of those incentives. The Seahawks‘ deal with running back Fred Jackson is a one-year pact worth $900K, according to Tom Pelissero of USA Today (via Twitter). The minimum salary for a player with Jackson’s experience is $870K, so unless Pelissero is simply rounding up, it looks like there’s a small bonus included. There’s no signing bonus on James Jones‘ new contract, per Rob Demovsky of ESPN.com. Demovsky says Jones’ deal with the Packers is worth the veteran’s minimum of $870K, so the veteran wideout will count for just $585K against the cap. Offensive tackle Nate Solder got a $12.5MM signing bonus as part of his two-year extension with the Patriots, according to Jeff Howe of the Boston Herald (all Twitter links). As part of the agreement, Solder had his 2015 base salary reduced by $6MM to $1.438MM, and had his 2016 salary ($6MM) fully guaranteed.